We’re excited to announce that Bloody Disgusting Presents: World of Death Volume 2 is now officially for sale in our online store. World of Death brings together the talents of hundreds of filmmakers from all over the world in a series that will terrorize, astonish, disturb, and excite genre fans. With new episodes premiering on BloodyDisgusting.com every week, horror fans will never be without a heaping mound of blood, guts and mayhem. 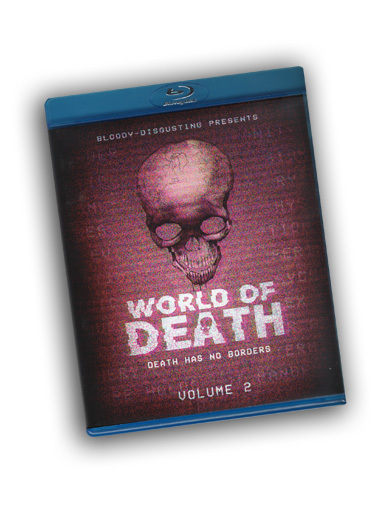 World of Death Volume 2 collects 29 of these shorts into one bloody good blu-ray. This installment features the original version of Bonfire Films’ short “Mother” starring Colbi Gannett (The New Mutants, HBO’s Olive Kitteridge) and Lisa Boucher Hartman (White Drift, The Hanover House).